The following photographs were kindly sent by Mrs Margaret Page. They show a medal, won by her great-grandfather, Thomas Richards. The medal is for 1st place in a 1 mile novices scratch race. It is likely that this took place at the Aston Villa football ground, which was used at the time for cycle events. 11th April 09:00 - 28 Miles (2 laps) - K34/14 - Part of Midlands SPOCO series - Under CTT Regulations. We report that Dai Davies, a former member of this Club, died in May 2009. 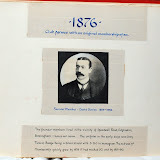 JH Reece was a Speedwell member in the 1890's. It is believed that he had a cycle shop in central Birmingham (near the Hippodrome theatre). There is a photograph of him in the Club album. The trophy and medals shown below are part of a collection donated back to the Speedwell by Mrs Wendy Roodhouse in 2008.